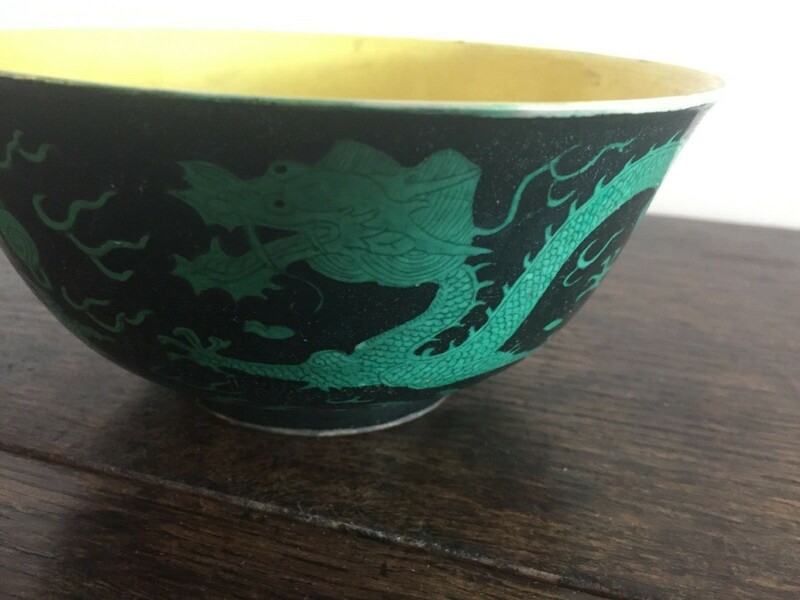 i retrieved this looks like chinese dragon bowl.can anyone advise on information what is it exactly and how old bowl could be? 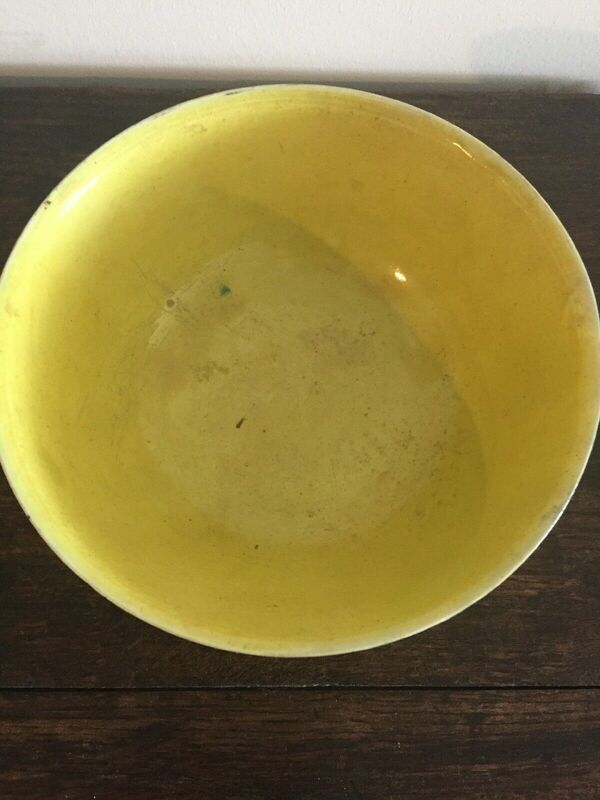 In my opinion, this bowl probably was made during the Republic period (1912-1949) or later. This view is based in part on the underglaze blue six-character mark of "Made during the Guangxu Reign" (Da Qing Guangxu Nian Zhi), which would have been imperial if of the period. 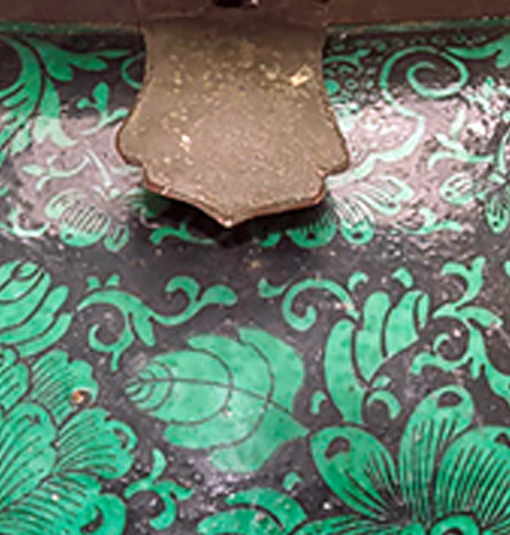 However, the green-on-black ground famille noire decoration is far from imperial quality, as the ground overlaps the edge of the green motif unevenly and has a "sizzled" look to its surface. 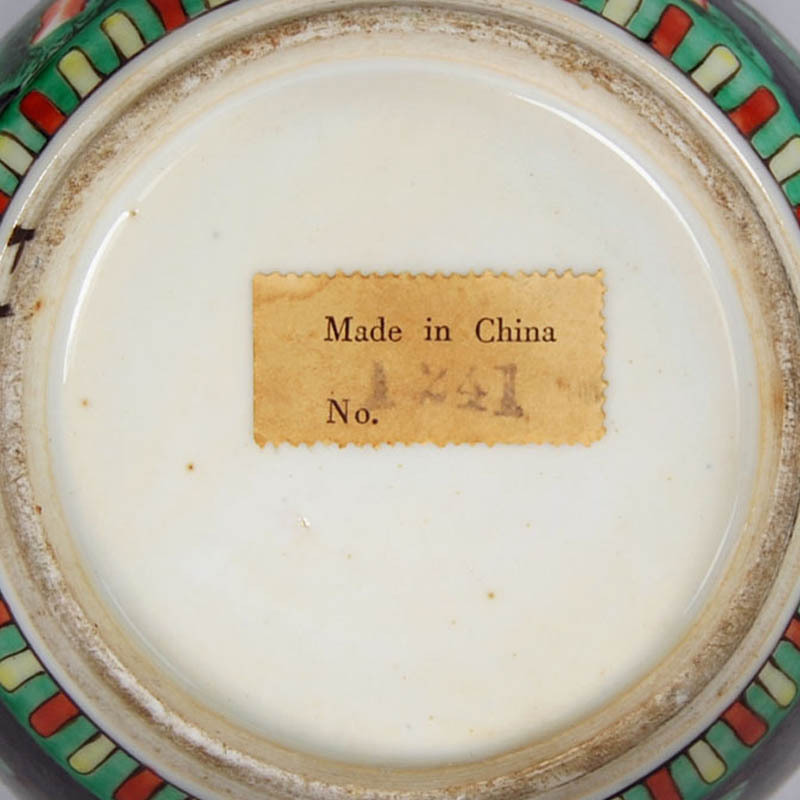 Pictures of Guangxu-period famille noire porcelains show an apparently more unctuous glaze without the "sizzled" effect, seemingly caused by tiny bubbles that arose in the kiln. 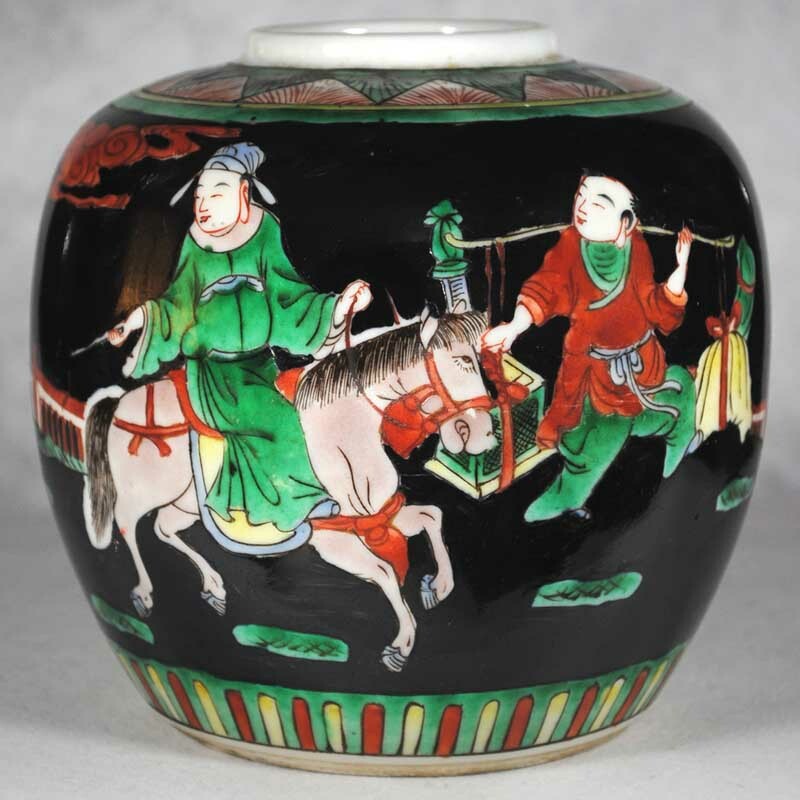 I do have one example, shown below, of what probably is a Republic-to-mid-century ginger jar with the same effect in its black ground. thank you for your opinion. There is age in this bowl for sure, no doubt. I am sure that you are correct on "republic period". 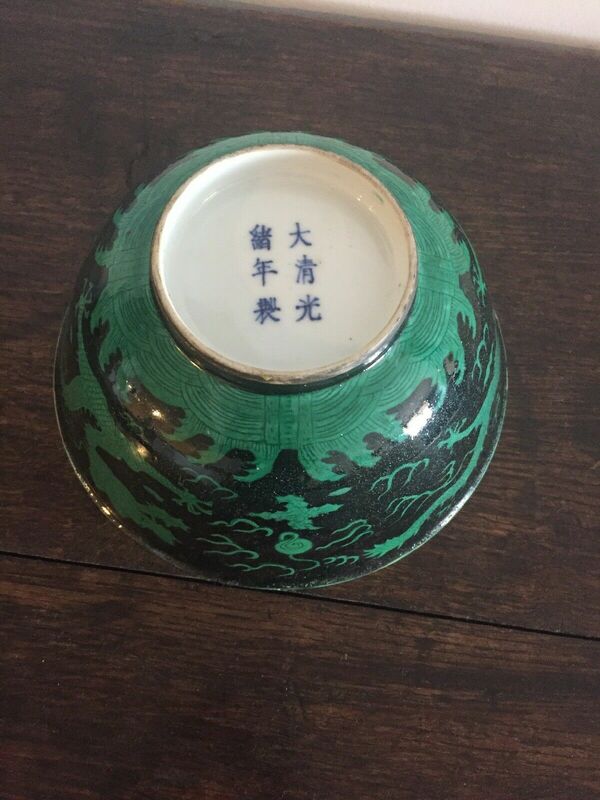 This bowl belonged to my uncle when he lived & worked in China long time ago, sadly I will not have a chance to ask questions when excatly he did purchased it and where and how and for how much. Is there any similarities "out there" in black & green from "guangxu" & "republic period" to take a look at, as I was not able to find anything much on the internet and I did spend quite few hours browsing internet based on your toughts..I think jar which you provided as an example to me - not even fair to compare with. Thank you for your replay once again! Hello, IMHO it is a later bowl being as new as late 1940's. These bowls are still made today. Dragon expressions are a giveaway as to age and your appears to be from that time. The mark is also somewhat incorrect and the five claws of the dragon are actually designed for the market outside China. All that said it could also be from the 1980's when the number of copies rose to a very high level although the wear is commensurate with the late 1940's date. 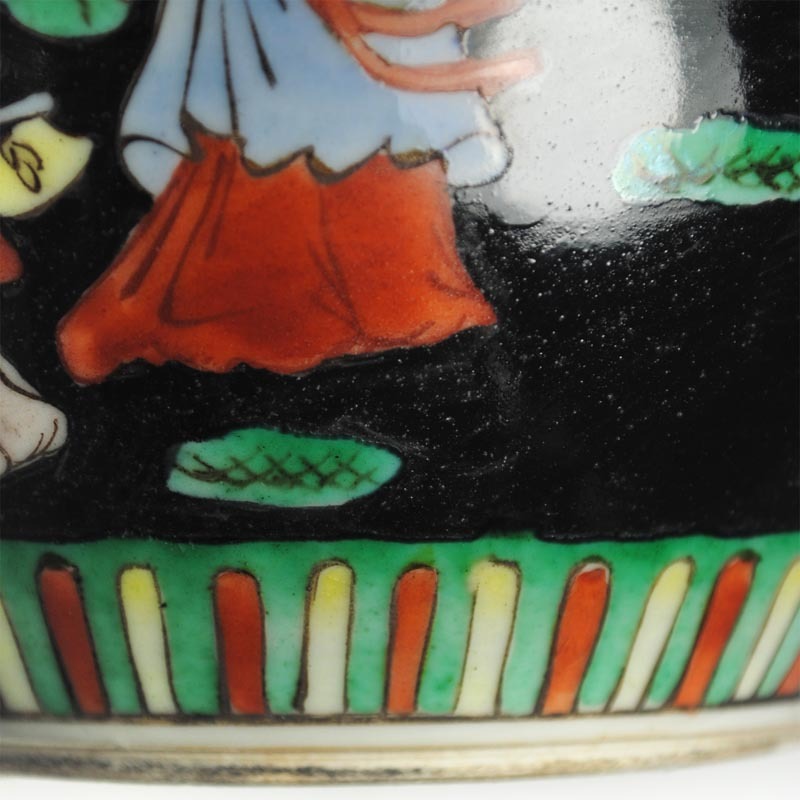 After posting my comments, I finally found a good image of an otherwise well-painted late 19th century famille noire porcelain jar (detail below), which also exhibits the same "sizzle" I cited in its black ground. While this extends the time frame of the basis for my views, I'd still say Republic or later for your bowl, due to the contrast in quality between its base-mark and painted decoration. Also, please note how much better defined the jar's motif is compared to the bowl.